16 Impressive and Amazing Newborn Baby Dolls that Look Real! 16 Amazing Lifelike Newborn Baby Dolls for Sale! A Baby Doll that Looks Real? A baby doll that looks real? Really? 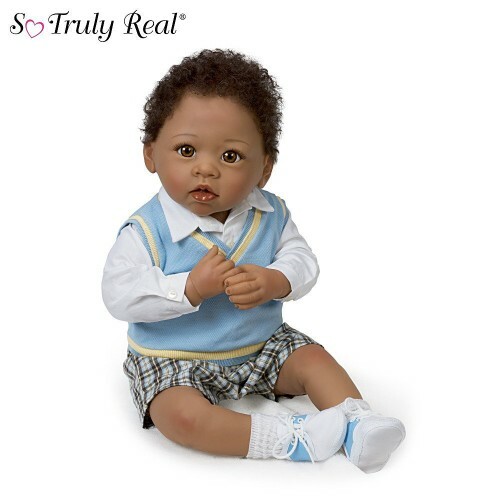 Baby lifelike dolls or baby newborn dolls are amazing baby dolls that look real! They look just like a real baby sleeping or happy in their crib! 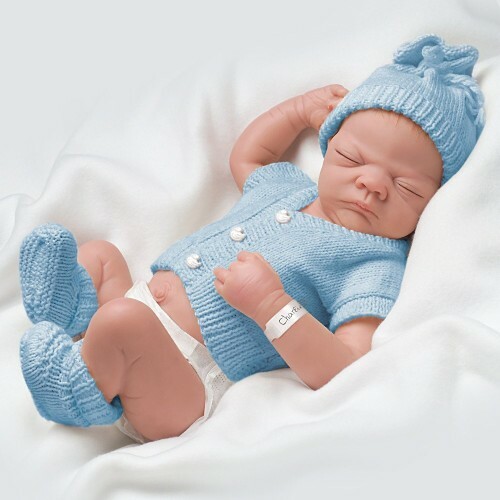 Most of these lifelike newborn dolls were created for doll collectors and not for children to play, and some can be for children and adults as well! All newborn lifelike dolls will come dressed up in a gorgeous baby outfit and some will have baby accessories too. On this page you are going to find and have a chance to buy the most amazing baby dolls that look real! They are all pretty much affordable, the most expensive ones around 300 dollars and many of them around 200 dollars and under. Like I said, this is not your ordinary baby doll! They are gorgeous and extremely well made newborn baby dolls made for collectors! I was totally amazed when I first saw them! Some of them look so real that if you take them on a stroller everyone will think it’s real baby sleeping! Welcome to the wonderful world of the reborn doll babies! Have you ever seen these impressive and very realistic newborn baby dolls before? Some look so much like a real baby, that people can actually put them in a stroller and take them out for a walk, and everyone will think it’s a real baby sleeping! The gorgeous newborn baby boy doll sleeping in the picture above is Charlie and he looks exactly like a real baby sleeping, doesn’t he? These dolls are anatomically correct and made of vinyl. They are not for young children to play with, but more for adult collectors. Down below you will see more realistic newborn baby dolls being sold! Beautiful New Baby Girl Sleeping Doll with Real Breathing and Heartbeat Movement! She is a beautiful new baby girl doll that looks real with a ‘breathing’ and ‘heart beating’ mechanism to make the experience even more realistic! Her features are so realistic that you will naturally talk very low around her, not to disrupt her sleep! This is another impressive lifelike awake newborn baby doll for sale! She is wearing diapers and a pair of pink socks! She also smells like a baby! Look at all her ‘baby wrinkles’ and chubby baby body! Perfect gift idea for little girls who just got a new baby sister in real life! Mommy can teach her how to properly hold and care for the baby using this realistic baby doll! She just makes you want to hod her right away! This is a gorgeous baby girl doll that is completely poseable! As you can see she is a very happy baby girl! She is looking straight at you and she can’t wait to meet her new bedroom! Her baby brown eyes are gorgeous! She also has beautiful rosy cheeks! Amazing Baby Dolls that Look Real! How amazingly realistic is this adorable new baby girl doll sleeping? I bet you can’t wait to hold this precious baby girl in your arms! Now comes the most exciting part! Twins! A boy and a girl twin baby dolls that look real! The little baby girl has her eyes open and she is looking straight at you! Real Looking Baby Doll with Milk Bottle! This collectible lifelike baby girl doll balances her bottle in not just her little hands, but her feet as well! She comes with her baby bottle! Happy buyers say she is absolutely gorgeous! Her hair is perfect and very realistic and she smells like baby powder! This adorable baby girl doll with her milk bottle looks so realistic that if you go out with her on your arms everybody will think she is your new baby! You can also move her arms and legs if you want. She has gorgeous blonde hair and beautiful blue eyes! Heart Melting Touch-Activated Lifelike Baby Doll for Sale! Beautiful Baby Girl Doll that Looks so Real! This is a very impressive girl baby doll that looks real! You won’t believe she is not a real baby! What a gorgeous collectible doll she is! A happy buyer said she is as beautiful as the picture! Those blue eyes and rosy cheeks will melt your heart! Did you know that she also ‘interacts’ with you when you touch her? This beautiful baby girl doll will coo just like a real baby when you caress or kiss her baby cheeks! She will melt your heart right away and you will find yourself gently caressing her cheeks every now and then! She also weights around 6 lbs, just like a real newborn baby! Will make a wonderful gift idea for any doll collector! She is a very cute African American baby girl doll who can’t wait to go home with you! When you hold her hand, her tiny fingers will wrap around yours! Just like real babies do! She is a large baby girl, at 22 inches! Happy buyers said she was totally worth the price and she made wonderful Christmas gift ideas for their daughters! He is a lovable and adorable cute baby boy with gorgeous curly hair! You will love him from the moment you cradle him in your arms and look into his gorgeous brown eyes! He is also wearing a very cute blue outfit! Gorgeous African American Baby Girl Doll that Looks Real! She is a gorgeous African American baby girl doll that looks incredibly real! I love her cute hair! She is very cuddly and so adorable! You will definitely find yourself carrying her in your arms around the house! Cute, Tiny and Sweet Awake Newborn African American Baby Girl Doll that Looks Real! What a cute African American baby girl doll that looks real! I love her cute sleep baby outfit! She has the most gorgeous ‘honey’ colored sleepy eyes! She is very sweet and very cuddly! Wonderful gift idea for a doll collector! 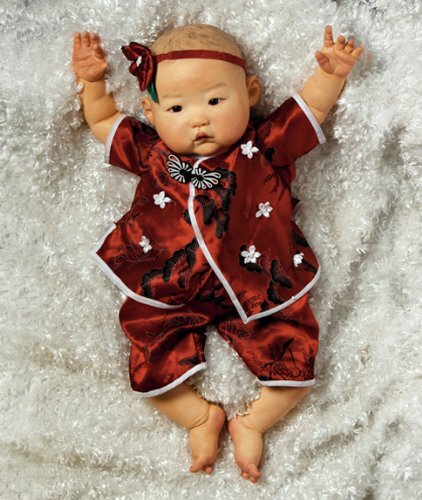 A very cute realistic Asian baby doll for sale! She is so cute that you can’t help but want to hug her right away! She looks to be about 3 months old! 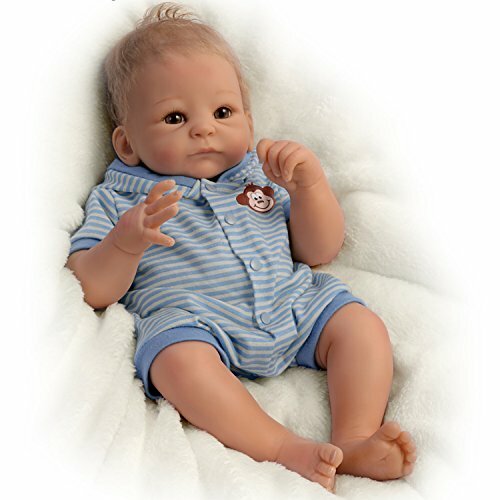 Cute Realistic Newborn Baby Boy Doll! This lifelike tiny blonde baby boy doll is the cutest thing I’ve ever seen!! His name is Benjamin and he looks just like a real baby boy!! Look at that face and gorgeous hazel eyes! He has a 17 inch weighted body, just like a real baby boy. He is looking right at you and wondering when you guys are going home! Beautiful Baby Doll Sleeping that Looks Extremely Realistic! Tiny Lifelike Baby Girl Doll with Cute Teddy Bear! A very cute and very tiny handcrafted sleeping baby girl doll holding her teddy bear! She is wearing a super adorable leopard print sleeper and the cutest pink bow in her fine hair! Her face is so perfect and so mesmerizing! She can be enjoyed by both adult collectors or children over 8 years old! *I hope you enjoyed my selections of cute baby dolls that look like real babies! Cute and Unique Adora Toddler Dolls!